Your Microsoft Outlook emails contain a wealth of business and personal information. Sometimes its just easier when some of that information is saved to your hard drive. It may make sense to remove file attachments from emails and save them outside of Outlook. As stand-alone documents, they can be more easily utilized when removed from the context of an email. MessaegExport is an add-in for Outlook 365/2019 that adds many new features to Outlook. 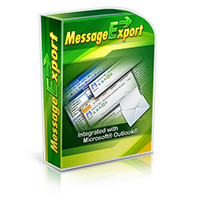 With MessageExport, Outlook can save and extract emails and file attachments in ways that can save you time. One day a MessageExport user contacted us for assistance. Her boss was involved in a law suite and now needed all of the file attachments that a client had sent her over the past five years. There were thousands of emails over that time period. Using MessageExport, she was able to automatically extract all of the file attachments in those emails and save them to a hard drive folder. Manually reviewing and copying file attachments from such a large quantity of Outlook emails would have taken her hours, perhaps days. MessageExport performed the task in less than 10 minutes. Download a free trial of MessageExport, and let us help you determine if our software is a good fit for your project or workflow.